For 12 years, there are clear trends that have allowed me to be very optimistic about the price of oil and precious metals. A barrel of oil rose from 20 to $ 100 per ounce 300 to $ 1600 an ounce and silver from $ 4 to $ 35 (annual average). Today, these trends remain, for me, still strong! 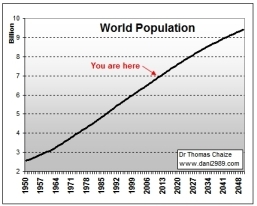 The main, most important, the most crucial is the increase of the world population. We could also add that in addition to increasing the world's population is more urban, aging, consuming energy, food and services, because, inter alia, the adoption of Western lifestyles. 1° Shortage of oil and energy. With a world population which increases continuously and conventional oil supply Breathless (peak production), it is likely that major tensions appear on supplies in the coming years. These tensions between supply and demand for oil will inevitably increase the marginal cost and the increase in oil prices in the long term. Fevers oil prices, as in July 2008, will return in time intervals become smaller. This will affect automatically on all other forms of energy production (the natural gas, coal, uranium, electricity prices, wood, wind, high geothermal energy, solar ...) . A growing population consumes more food (dietary changes), will increase the demand for agricultural raw materials (meat, soy, rice, corn, wheat, vegetables, etc.). But the decline of arable land (desertification, pollution, urbanization, climate change) and limited access to water will restrict supply worldwide with the rising cost of energy. Rising oil prices will also weigh on production costs of agriculture heavily dependent on oil for its consumption of diesel, fertilizers and pesticides (for a brief summary). Biofuel production directly related to the increase in marginal cost of oil production will compete with food production. 3° Lack of drinking water. With the increase in population, the demand for water will continue to grow and supply remains limited in some parts of the world. Climate change, pollution and energy prices increase this. These trends feed each other and create an accelerating effect on other issues that may be pollution, climate change and security. Access to reserves become vital for many states or companies and tensions rise. These new strains have originated from the control of these valuable reserves. Because these reserves will be inadequate to meet the demand of a population increasingly important. For me, the heart of the problem is the discrepancy between the increase in world population and the stagnation / decline in the supply of conventional oil. This is what we call a trend. That is why in 2013, as in 2001, I intend to continue to monitor on both my mailing only these trends particularly conventional oil.